Oligocene petrified wood. Image courtesy of Jim Pruske, Washington Department of Fish and Wildlife. *DNR is in the process of updating the rockhounding/goldpanning policy. Please check back for more detailed information. Washington has an extraordinary variety of rocks and fossils. Collectors have the opportunity to find beautiful agates, amethysts, garnets, jaspers, opals, and even the occasional nugget of gold. Our state also has a plethora of fossils including crinoids, clams, trilobites, snails, corals, and at least one dinosaur. The state also has abundant petrified wood, which is the Washington State Gem, and has had over 40 Columbian Mammoth discoveries, which is the Washington State Fossil. Who owns the land you intend to visit? What are the specific rules about collecting rocks or fossils on this land? Are there special rules in regards to gold panning? May I collect vertebrate fossils, meteorites, or archeological artifacts? Finding out where, how, and what you can collect can be complicated. Each land owner generally has its own set of rules for collecting activities. It pays to do your homework in this regard, as fines for collecting without permission can be hefty. Before you set out, determine land ownership of your area of interest, learn the permissible collection activities and that owner's rules governing where you can collect, what you can and cannot collect, and how it may legally collected. Eocene gastropods (Turritella), found near Tono, WA. Image courtesy of Jim Pruske, Washington Department of Fish and Wildlife. 2. State Trust land that the DNR manages in trust to provide revenue for various public institutions, including K-12 schools, universities, counties, and junior taxing districts. 5. No mechanized equipment (or explosives) is allowed for exposing, collecting, or transporting rocks/minerals to a vehicle. Gold panning is not allowed on State Trust lands. It may be authorized on State-owned aquatic lands, but the individual must obtain a use authorization from Aquatic Resources Division. If you get authorization, you will also need to have a copy of the Gold and Fish Pamphlet on you at all times. See the Gold Panning section for more information. Public lands managed by the Federal Government which allow rock-hounding and fossil hunting or have designated sites for those activities are managed by either the USDA National Forest Service or the Bureau of Land Management. Contact local agency staff for specific information. The Oregon and Washington Office of the Bureau of Land Management maintains the records of mineral claims on federal lands. This office can field any questions about finding existing mineral claims or establishing new claims. Contact them by phone at 1-503-808-6001, ext. 2. If you own property and the associated mineral rights, then you have the right to collect on your property or to give permission to others to do so. If you are not sure if you own the mineral rights to your property, check the property deed, or contact the County Assessor’s office. Patented or unpatented mining claims are considered private lands, and you must obtain the owner's or claim holder's permissions before proceeding. The state’s streams that contain placer gold are also important for the plant and animal communities they support. To protect stream and streamside habitats, the Washington State Department of Fish and Wildlife (DFW) administers the Hydraulics Code (RCW 75.20.100). This requires that any person or government agency desiring to use, divert, obstruct, or change the natural flow or bed of any river or stream, or utilize materials from stream beds shall obtain a Hydraulic Project Approval (HPA). Anyone seeking to do this on state-owned aquatic lands must also receive a use authorization from DNR's Aquatic Resources Division. 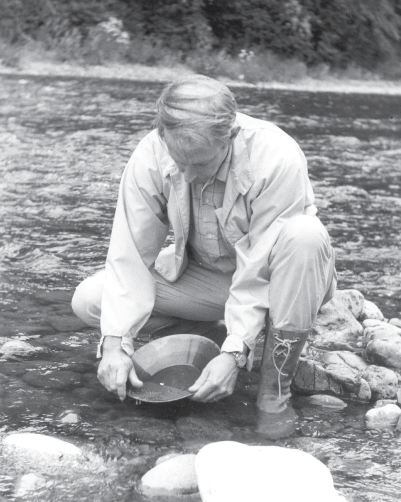 Gold panning is not authorized on DNR-managed State Trust land (i.e. non-navigable stream passing over DNR State Trust lands). A formal HPA is not required for recreational panning and prospecting if you use a gold pan, mini-rocker box, or nonmotorized, small sluice box. However, you must have a formal HPA for sluicing and dredging. Placer gold miners on Skookum Creek, circa 1918. The DFW publishes the booklet, Gold and Fish, which provides details and definitions for use by recreational gold panners. You must carry this pamphlet with you whenever you are panning and learn and follow its rules. The booklet also lists the classes of different streams and seasonal restrictions to certain activities on the various streams. You must also find out if the area you have selected has any current mineral leases or existing prospects so that you don't inadverently jump someone else's claim. If you have any questions, contact the DFW. While the Gold and Fish pamphlet is required, it is still vital that you obtain land owner permission and fulfill all of the requirements under that jurisdiction before you can begin to legally prospect for gold. Gold miner panning on the Nooksack River, circa 1976. For more information on gold in Washington, view the resources listed below. Due to the rarity and the importance to science, meteorites, vertebrate fossils, or any archeological or historic artifacts cannot be collected without a permit. Permits will only be granted for scientific purposes. If you’ve discovered any of these items, please contact the appropriate agency (for example, Washington Department of Natural Resources, U.S. Forest Service). Gold panning is not allowed on State Trust lands. We highly recommend viewing this Story Map in full-screen mode. There are many ways to learn more about the amazing rock and fossil resources we have in this state. You can start by purchasing educational guides or textbooks that explain more about how rocks were formed, or the depositional environment which a fossil was preserved. You can also visit museums like the Burke on the University of Washington Campus, in Seattle. Stonerose Interpretive Center is a great option for fossil hunting. For a small fee, you can likely take home some great fossil specimens of your own as it’s a designated area for this activity. Lastly, you can get involved with your local rock and gem club, listed here and here. 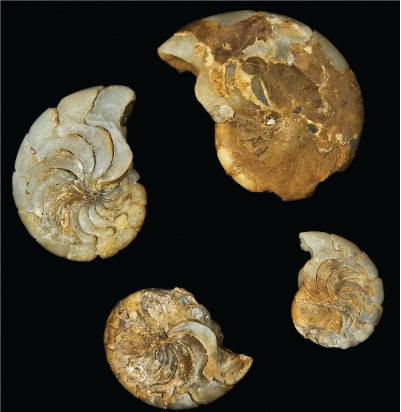 Oligocene cephalopods (Aturia angustata), from the Lincoln Creek Formation near Raymond, WA. Image courtesy of Jim Pruske, Washington Department of Fish and Wildlife. For more information, view the resources listed below.